I have a thing about Nash Metropolitans, and now there's a customized one on display at UBC's Museum of Anthropology in Vancouver. The "Lois Lane Car" (she drove one in the original Superman series) may be seen at MOA's Great Hall, a gallery and performance space that has been temporarily transformed into a parking lot. 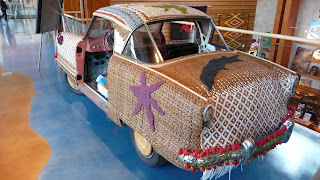 The unusual exhibit by Annie Ross, titled Forest One, is a full-size, 1956 Nash Metropolitan that Ross wrapped, twined and plaited with cedar bark and other reclaimed materials. Dr. Ross, a weaver and Assistant Professor in First Nations Studies at Simon Fraser University, used bark salvaged from clear-cut urban forests -- completely transforming the car inside and out. According to the artist, Forest One speaks of "colonization, urban sprawl, trash and remediating the urban landscape through acts of salvage."